Gulf front luxury with spectacular views of the beach and the bay from a 6th floor wrap around balcony. Located on the highly desirable west end of the Island Princess property, the balcony features a bar height patio set which allows an unobstructed view of the Gulf. You can watch the dolphins play in the morning and enjoy our exquisite sunsets in the evening. Inside... enjoy your impeccably decorated beach home. Each bedroom has its own flat screen HD TV and private bath. The kitchen is well equipped for the chef in your family. The living area includes a flat screen HD TV, a DVD player, surround sound system with Ipod docking station, CD/stereo system and a sofa bed. Watch the action on the beach from your two leather recliners or stretch out on the sofa with a good book from our reading drawer. Cable TV and High Speed and wireless internet service are free. For your enjoyment, a well-equipped exercise room and a comfortable card room are located on the ground floor near your elevator. Island Princess is located on Okaloosa Island, out of heavy traffic yet within 5 minutes of great restaurants, and it's close to just about any other vacation activity you can imagine. Enjoy this beautiful escape from a busy world! Welcome to our 'Home Away From Home.' We live in Pottsboro, Texas, on the Texas/Oklahoma border, one hour north of Dallas. It is an 11 hour drive to arrive at our beach home, however well worth it when we arrive and see the beautiful views. We absolutely love spending our family vacations on the white sugar sand beaches of Okaloosa Island. Fort Walton Beach offers wonderful local restaurants and many more in nearby Destin just 10 minutes away. 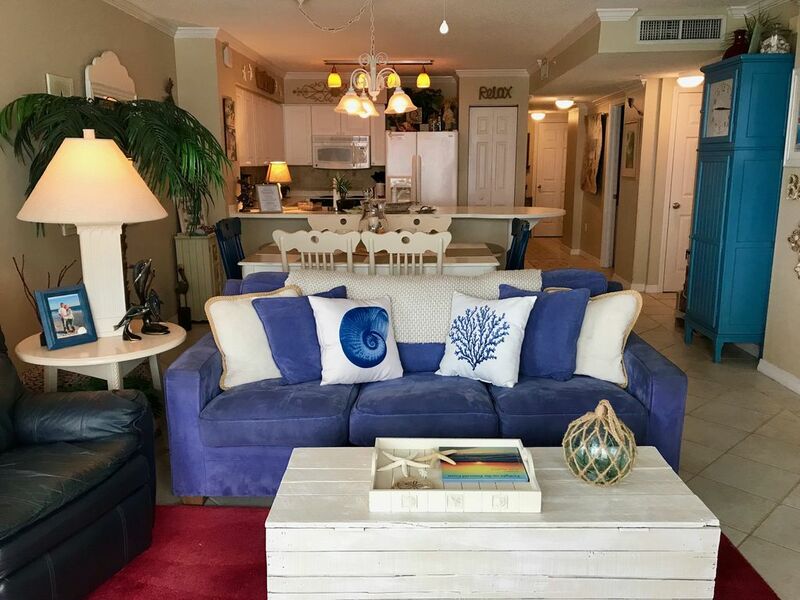 We love the relaxing feeling we get when we arrive at our Island Princess Condo. It truly is our home away from home. We tried not to leave out any amenities. With wonderful restaurants and grocery stores nearby, there is no need to go far to enjoy a wonderful family beach vacation. But if you so choose to venture out, you won't be disappointed at what Fort Walton Beach and Destin have to offer. Ice and water in the door. Well equipped--owner loves to cook! (4) Flat Screen HD TVs. Surround sound system in living room with Ipod hook up. West end wrap around balcony faces beach with a view of the Bay. Enjoy the beautiful sunsets from your balcony. Highly desirable West end unit. Bar height patio furniture allows unobstructed view of the beach and ocean. Inside enjoy the views from your leather recliners and sofa. Enjoy a selection of books and games for your inside enjoyment and beach toys for your beach time fun. For those of you who want to work out during your stay, check out the exercise room on the West end first floor. Fantastic rental! It has everything imaginable to make out stay perfect. The kitchen was awesome and plenty of games for rainy days. The view is gorgeous! Comfy beds and great little portico greeted us after a long drive. Such a great place! We'll definitely be back! Loved Okaloosa Island. Not so many high rise condos. Walking into Joy’s condo was like walking into a friend’s house. Very comfortable. Proximity to beach couldn’t have been any better. Coffe every morning on the balcony. Really liked being on the 6th floor. Not too high, not too low. Just right. Had everything we needed and more. Didn’t want to leave. Thank you Joy! Thank you so much for your kind review. We love it that you loved our "home away from home" as much as we do!! We strive hard to make sure our guests have everything they need in the condo with a full equipped kitchen and all the comforts of home. We hope we can accommodate you again for a future beach vacation. We had six adults and a 2 yr old and it was plenty of room for us and then some. View was amazing and condo had everything we could think of. Location on beach was awesome and so were the guys who rented the beach service. Very nice and helpful. We will be back. Thank you for your kind review. We are so happy you enjoyed our "home away from home" as much as we do and it met all your needs. We look forward to accommodating you on a future stay. This condo includes all the EXTRAS you need for your beach vacay!!! This condo was absolutely wonderful!!! It had a beautiful view from the balcony and inside the condo. It was decorated super cute and beachy-like!!! It had all the kitchen stuff you need and a big kitchen table. It comes with 2 beach chairs and an umbrella. All the things you want in the condo! But wait, the best part of this condo is all of the extras that come with it. First, this condo is a corner unit so it has a corner private entry to the condo. This entry way has all the extras you need for the beach that you would normal buy and then have to leave behind because you did not have room to take it back home. It has boogie boards, sand buckets, crab nets, toys, kites, extra chairs to take to the beach and sit on the water. It had room for us to store our hitch and haul that we took with us. Inside the condo there were plenty of extra beach towels to use, plenty of drawer space and closet space so you can unpack for the week. The beds were comfortable and the living room couch and chairs were very comfortable. We would definitely stay in this condo again! The unit was very nice with a great view of the Gulf. The bedrooms and bathrooms were a perfect arrangement for our party of 6. The kitchen was incredibly well stocked. The pool area, however, was a disappointment. Thank you for your kind review. We are so happy you enjoyed our "home away from home" as much as we do and the condo met all your needs. We hope we can accommodate you on a future stay. Condo was perfect for 3 adults and a toddler. Loved that it had the extra gated porch area outside - good for leaving shoes out and keeping kids in! Plenty of beach chairs and things to use so we didn’t even unpack ours. The only negative was the beach service. We had the free chairs but most of the front row - about 15 on each side - were reserved. We tried going out early to save some when we saw them setting up but were told we needed to wait until all the reserved tags were out. One morning after finding them all full in the front I set up my own chair in front of that and one of the owners complained and I had to move. Other than that, the condo was perfect. Thank you for your kind review. We are so happy you enjoyed our "home away from home" as much as we do and it met all your needs. We are sorry you had a bad experience with the beach personnel. It's a busy time but you should definitely been able to get a front row set up. We will address this with our beach service. We hope we can accommodate you on a future stay. See the dolphin act at the Gulfarium or visit vintage airplanes at the air museum. Rates do not include all taxes & fees. Rates are subject to change until reservation is confirmed. Bookings are Saturday to Saturday with check in at 3 pm and checkout at 10 am the following Saturday. All cancellations will be charged a minimum fee of $75 for processing the refund transaction. Cancellation Policy - 50% refund if cancelled within 30 days before arrival date. 100% refund if cancelled within 60 days prior to arrival date.